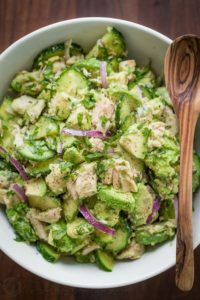 In a large bowl, mash up avocado with the back of a fork or potato masher. Combine all other ingredients and mix well. Serve on toasted bread, on top of greens, or enjoy it all by itself. Leftovers should keep for several days in the refrigerator.